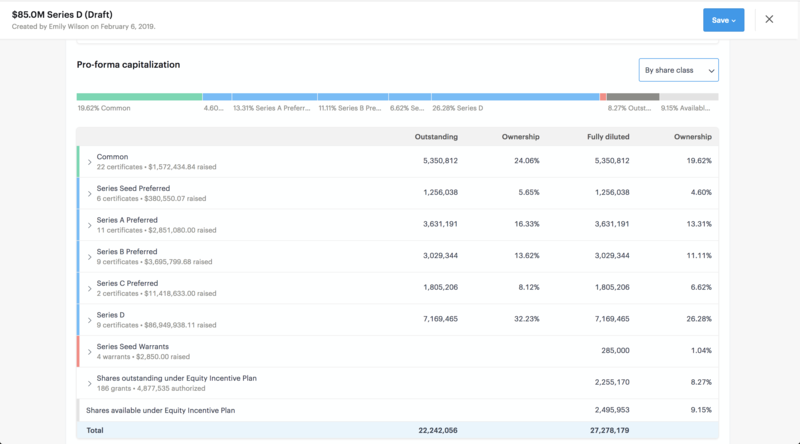 The financing round modeling tool allows you to model new preferred financing rounds for your portfolio companies understand the impact it will have on your company’s capitalization structure. Pre-money valuation: The valuation for the company prior to the new capital being invested in the round. Total new investment: The amount of new money being invested in the round. 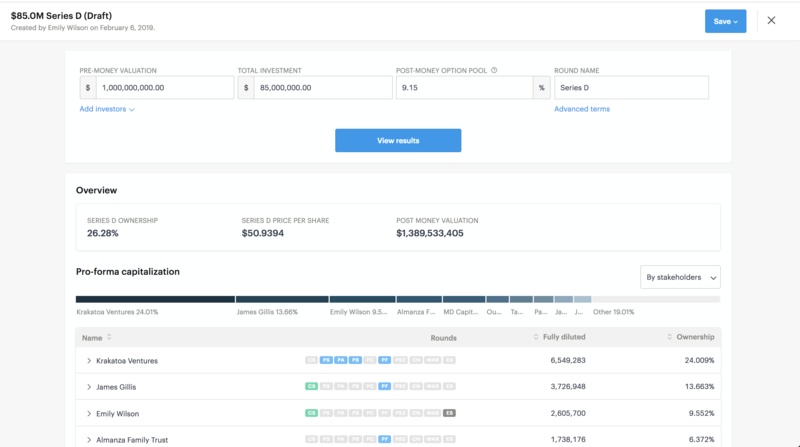 Post-money option pool: The post-money option pool allows you to input what your desired ending option pool will be after the round is complete. Our model uses a solver function to iterate on the calculation and figure the required price per share and fully diluted in order to achieve your inputted option pool amount. Round name: The name of the new preferred share class (e.g. Series D). Add investors: The add investors dropdown allows you to allocate the new investment money to your existing investors. Advanced terms: The advanced terms modal, allows you to specify the rights and preferences of the new share class. The rights and preferences include; liquidation preference multiple, seniority, dividends, and participation. If un-edited the model will default to pari-passu seniority and a 1.0x liquidation multiplier. Overview card: The overview card shows you key data points from the modeled financing round included; price per share of the new share class, the new share class’ fully diluted ownership, outstanding options, and ending post-money valuation. Capitalization: The capitalization section will show you what the cap table of your company would look like if the modeling financing round were to be completed. You are able to view it by stakeholder and by share class. Once you have created a financing round model, you are able to save and share with other members of your team. 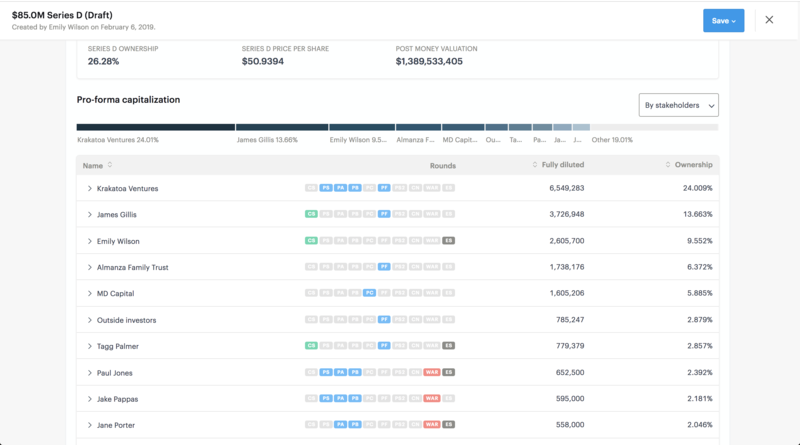 The financing round modeling feature uses your inputs and the existing capitalization to calculate the price per share and fully-diluted counts for the new share class. For companies with existing convertible notes or SAFEs, we currently use the pre-money method, as described here. Financing round modeling is currently only available for C-Corps.